Each quarter, Alphinity Investment Management’s portfolio managers share their expert views on the trends and themes emerging within their relevant sectors. This quarter, we share our thoughts on the current trends and outlook for the insurance sector. The insurance sector includes General Insurance (the focus of this paper), Life Insurance and Health Insurance. The listed General Insurance sector has a number of large domestic insurance underwriters including Insurance Australia Group (NRMA Insurance, CGU and SGIO); Suncorp (AAMI, GIO, Suncorp, Vero); and QBE. There are also a number of companies that act as agents and brokers in the industry. Steadfast and AUB group are the largest listed broker examples. General Insurance can be split into two distinct categories. “Personal Lines” insurance, incorporating home, motor, and compulsory third-party insurance, which is sold typically to the general public and which tends to be most influenced by domestic conditions and players. “Commercial Lines” which refers to insurance sold to Corporates, for example, property insurance or liability insurance. These tend to be more influenced by global market conditions. Why is the insurance sector looking more interesting now? Insurers’ profits have been under pressure in the last few years. In personal lines insurance, after the price boost they got in 2012 following the Brisbane floods, pricing has been more moderate with increased competition. Increased claims inflation has been evident, either through pressure from large events (e.g. hailstorms), or from large pick-up in parts inflation. Examples include motor claims and costs per claim, where more technology in cars means more cost per accident. At the same time commercial insurance has been under pressure for almost a decade. Large amounts of global capital in the insurance industry has resulted in consistent decline in prices, with global providers of insurance capital happy to accept lower returns to achieve greater diversification. What we have seen more recently is a long-awaited change in the pricing environment in Australia across most lines of business. At the same time large cost and efficiency programs have been launched by the listed domestic insurers aiming to improve returns. Why is insurance pricing increasing? Historically, pricing changes occur after a large insurance loss or series of large losses. These require repricing of risk, to replenish capital or to take into account a risk that was previously mis-priced. The events around September 11 are a good historical example, or the large hurricanes Katrina, Rita and Wilma that hit the US in 2005 and devastated New Orleans. In Australia it has rather been a long period of pricing pressure, low interest rates and, more recently, an increase in claims inflation in motor insurance. These, added to a number of medium sized events, have culminated in the domestic insurers all producing unacceptable returns. However, a series of new CEOs, as well as shareholders demanding better returns for the risk these companies take, has resulted in an unprecedented period in which the large domestic insurers have been moving prices up in tandem in a bid to improve returns. We are also starting to see that occur in higher-end commercial insurance, which is being driven by global factors. Q4 2017 turned out to be one of the most costly periods for insurance companies ever, with three major hurricanes hitting the US (Harvey, Irma and Maria) plus deadly wildfires. Swiss Re estimate total insured losses were $136bn in 2017. This has seen a stabilisation in reinsurance and commercial pricing globally. 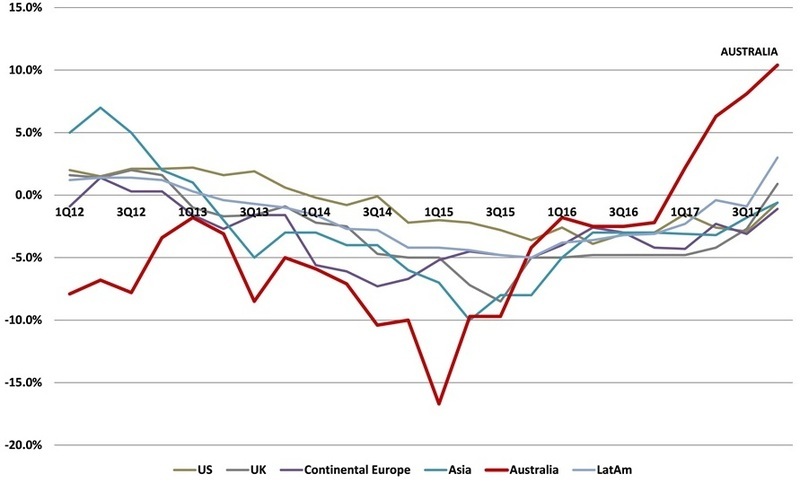 Figure 1 shows that the material change in Australian insurance pricing is well ahead of the rest of the world. Globally we are also just starting to see a small turn which should help sustain the Australian improvement. How to play the sector? Insurance pricing can take some time to work its way through to the bottom line. For example, even if you put up pricing today, it takes 12 months for all policies to be renewed then a further 12 months to fully ‘earn’ the premiums. Given that the cycle in Australia has not been driven by a single large event, and instead evolved over the last 12-18 months after a long period of pressure, the price rises are potentially slower but should be more sustainable. At the same time, the companies’ cost and efficiency programs that were implemented to improve returns should largely be realised in 2019 and 2020. It therefore appears to us that, as we roll into the next two years, earnings and returns from the listed insurers should be materially improved, although some patience is required. Insurance Australia Group (IAG), Suncorp (SUN) and QBE all take underwriting risk, i.e. their results will move around with insurance losses. IAG is the quality pure play, but trades at a higher valuation. SUN also has life insurance and bank exposure and has been more volatile, but is the value play. QBE is more global than domestic and has had material internal issues that they are sorting out. Despite apparent value it generally represents higher risk. The brokers, Steadfast and AUB Group, don’t take the same risk as the insurers and therefore have far less earnings volatility; they just get a fee or commission up front on the higher premium rates. However, they trade on higher price/earnings multiples. They are also smaller, less liquid investments. The rising tide will likely lift all boats eventually, however the domestic market players seem more likely to benefit earlier. A fantastic article Andrew, look forward to Alphinity's visit to Brisbane in June! Keep up the great work on the portfolios.